Deville’s Pad in East Perth was an essential part the independent Perth Entertainment scene between 2008 to 2015. The pad was a fantastic busy nightspot and live Perth entertainment venue. Trapped between the railway line and some mixed usage streets punctuated by a number or red light establishments, one had to know where he was going to find the place. Yet then again, it’s large sign and smoky terrace was clearly visible form the commuter train approaching when making it’s exit from the City. 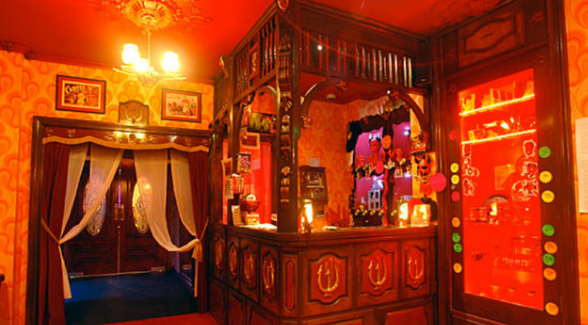 The spot was known for its jaw-dropping themed decoration, strict dress code, amazing bar (with absinth! ), regular gogo dancing and a motley crew of cool staff. ‘Americana Dinner’ food and regular appearances from great local bands made it a winning visit. Oh yes, and there were regular appearances by local magicians and illusionist to add to the mystique. Pierre Ulric was resident magician at the Deville’s Pad from 2008 to 2010 and was at the time invited to perform several weekends nights following the bar initial opening. His mandate: to electrify, amuse and bemuse patrons, spreading mirth and mayhem. He achieved this by delivering his infamous white tuxedo stage skits (15 minutes, twice a night during the first few months of the establishment’s operations) and performing intimate up-close strolling magic amongst the revellers in between sets. Unfortunately the venue closed down in 2015. The bar has recently re-opened as the Badlands bar… Let’s hope it has kept the same great vibe.